Review written by and copyright: Rick Curzon (1st February 2019). Efficient, enjoyable action film has good performances, plenty of humour, some moments of hard violence and some uncomfortable bits such as the scene where the supposedly likeable Duvall roughhouses his wife. Jerry Goldsmiths score is effective; keeping it all bubbling along nicely. Director Tom Gries made this and Breakheart Pass (1975) back-to-back with Bronson, Ireland and Goldsmith. It's not in the same league as Breakhert Pass but is still worth a view. Very loosely based on a real prison break. An extremely well shot widescreen actioner with a grand naturalistic colour palette typical of the era and very much in line with thrillers like Charley Varrick (1973), The Mechanic, Scorpio (both 1972) and Dirty Harry (1971). Reds are vivid and the overall image has a warmer cast with browns and earth tones coming across nicely. Fleshtones are satisfyingly rich. Black levels are mostly very deep and rich with no unintended crush; although occasionally shadow detail can disappear it's down to production methods and shooting rather than transfer glitches. Contrast is very healthy with most of the production shot on exteriors and in the daylight. There are no blown out whites so detail is consistently strong. There doesn't appear to be any digital tinkering with no signs of DNR or edge enhancement that I could detect. Grain is healthy throughout although it gets courser during opticals, slow motion and during process shots like fades. Encoding is strong and well up to the high standards we've come to expect from David MacKenzie and Fidelity in Motion. Shy of a new 4K restoration and following UHD Blu-ray with HDR we aren't going to see big improvements. An excellent mono track that serves the film very well; a well-crafted mix of dialogue, music and sound effects never gets out of hand and hard on the ears. Dialogue is always clear, music ebbs and flows appropriately with no clipping or other signs of distortion. Subtitles for the hearing impaired are essential and welcome. Audio Commentary by film historian Paul Talbot, author of "Bronson’s Loose! The Making of the ‘Death Wish’ Films and Bronson’s Loose Again! On the Set with Charles Bronson"
THE extra of choice next to the booklet. Talbot is THE man when it comes to Bronson and I've heard several of his commentaries now, and they're all topnotch and very informative. He's one of the few commentators who just doesn't need anyone along for the ride; filling the time with plenty of hard facts, trivia and info. He has a fascination with the cars and vehicles in these films and is always on hand with specific model numbers. I've read both of Talbot's books and can strongly recommend them. Brief vintage puff piece made for french TV to promote the film's French location shoot. Early home video release on Super 8mm film; image is very ropy by today's standards but I have great nostalgia for these as I used to check them out of the library. Vintage promos, typical of the period. Brief but choice still gallery in HD. Another very well done booklet with two excellent articles by Lord Paul of Talbot: An overview of the film and and an overview of the real life 1971 prison escape that inspired the film. The contemporary critical responses are limited to two UK reviews; one for and one against the film. 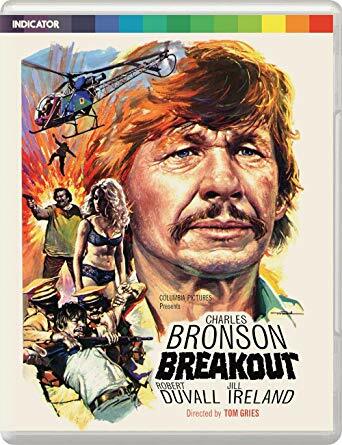 An impeccably produced addition to Powerhouse Film's Indicator series and another in the increasing library of Bronson films on Blu-ray; you can never have too many Bronson Blu-rays. Picture and sound are as good as can be given the older master used, but luckily it's a decent master well encoded. The film may not be a prime example of the prison escape genre but it's certainly a rock-solid, enjoyable actioner with plenty of touches of humour and humanity.